Air fryers have seen a spike in sales as they have become famous as being the healthier way to enjoy French fries, fried chicken and anything else that brings on the feeling of guilt. How Does It Fry Your Food? 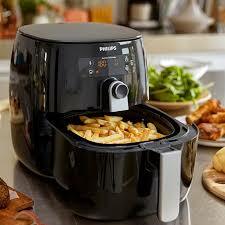 An air fryer used extremely hot air with a very small proportion of oil that is less that can be measured in drops. 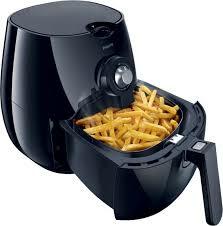 It uses the extremely hot air to achieve the same final product as deep frying but with practically no oil. Air frying depends on what is known as the Maillard effect which is very similar to caramelization because they both brown the food without the use of enzymes. In totality, you will only be using about a tablespoon of oil. Rather than having any resemblance to a frying pan, it is more like a mini oven with a drawer. You simply put your food into that drawer, slide it back in and adjust the temperature along with the timer. You will need to drizzle your food with the necessary oil before you pop it in but there are a few people who use the fryer with no oil whatsoever. As odd as that sounds at first, the final product is quite decent and it keeps things even healthier. There are four main parts of the machine that makes up the complete model: The drawer, the mesh-based bowl that goes inside the drawer you slide, the main machine and an oven-like rack if you are looking at using it for pastries. For most foods, you have to simply place the mesh bowl inside the drawer before you add your food in. The Philips Airfryer which is considered the original Airfryer and is more dependable than a cheaper model available on Amazon is available online £160. This also includes a mini recipe book that you could follow to get a hang of things. A simple way to get started though is by placing your timer for five minutes and setting the air fryer to 190°C. This could act as your middle ground from which you can add on or minus minutes if necessary. Another tip that could make everything easier is if you use a spray can to apply the oil on to your food rather than brushing it on. Overall, it is a good investment if you are looking for healthier options without having to torture yourself with a kale salad and celery juice. 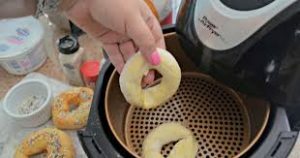 There are also options to use the air fryer to grill, bake and make a roast if you are ready to buy additional parts separately.